Three of Wands – My Ships are Coming In! The number 3 in numerology can indicate creativity, groups, goals and initial achievements, growth, and expansion. When the three of wands appears in a reading, it indicates that you have taken the steps to put your goals into action. You were able to do this due to the planing completed during the two of wands phase. It is also important to remember that although the ships are coming in, they have not actually arrived yet. Therefore, proper planning should continue for the duration of the project. This is also a good time to reevaluate plans if needed. It will also being important to accept any new opportunities, as they will lead to growth and expansion. When the three of wands appear reversed in a reading, it can indicate that plans have not turned out the way you had hopped they would. Some reasons could be due to a lack of inspiration, delays, lack of creativity, and lack of collaboration among groups. Two of Wands – The World is my Oyster! 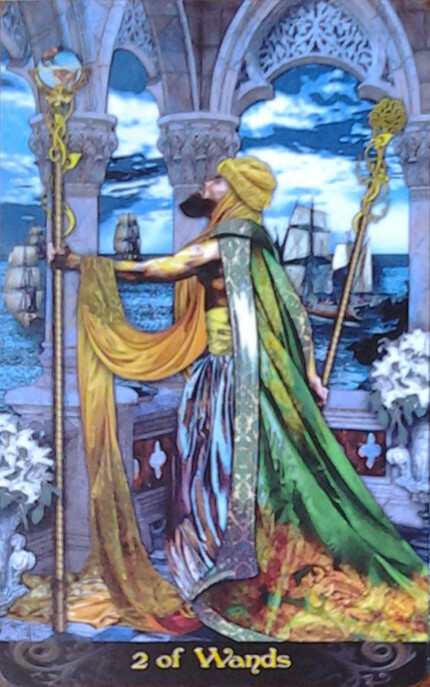 The Two of Wands generally indicates the need to explore one’s horizons. However, in order to ensure success, proper planning is required. The Two of Wands asks that we look to our inner self and use our judgment to make wise decisions about our endeavors. The Two of Wands is a great card to see in a reading because it indicates success as it pertains to projects, goals and new opportunities. 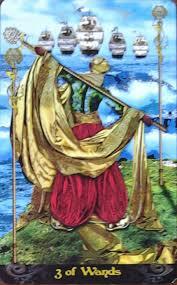 The Two of Wands indicates rapid growth and success due to sound planning. Some Key Words for the Two of Wands are planning, decision , partnership and goals attained. When the Two of Wands appears reversed, it can indicate that you are fearful of taking the steps needed to initiate your project/goal and accept new opportunities due to a lack of planning. Fearful of the unknown! What are your thoughts on the Two of Wands? Last week, I finally stepped out of my comfort zone and purchased a brand new deck of tarot Cards – The Tarot Illuminati. The Tarot Illuminati was illustrated by Erik C. Dunne and the companion book was written by Kim Huggens. 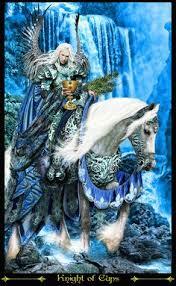 I normally use the Rider Waiter tarot deck but was drawn to the sumptuous colors in the pictures. The Illuminati tarot card deck is not associated with the secret society named the Illuminati but rather the light of wisdom displayed in the tarot deck. The Illuminati tarot deck is beautiful. It features gilded gold-colored edges and the cards are made from a really nice sturdy card stock. The Companion book is quite nice too! The companion book is put together well and features glossy pages, full size color pictures and insight for each tarot card. The Tarot Illuminati Kit comes with the Illuminati tarot deck, companion book and is contained in a high quality box featuring a magnetic closure, a picture of the High Priestess on the front and the Knight of Cups on the back of the box. Classy! 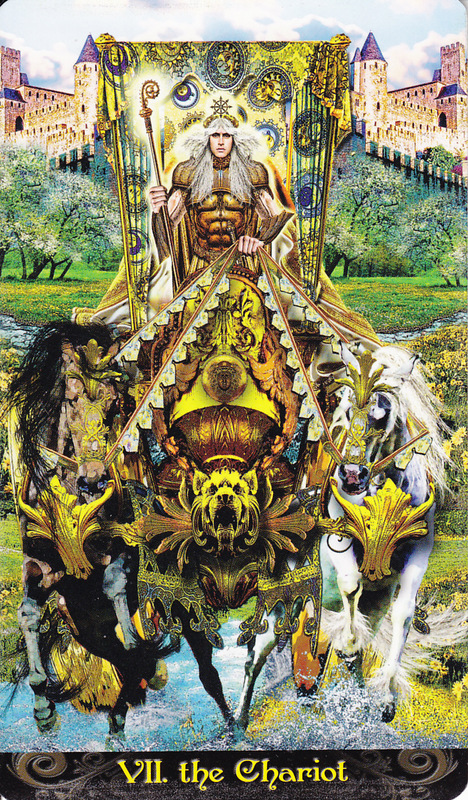 There are a few cards that appear to look strange to me such as the Chariot, the Hierophant and Temperance as some of the dimensions of scale seem to be off and so thoughts of something being off keep running through my mind when I look at them. Dunne has actually changed the names of some of the cards. For example the Magician is referred to as the Alchemist, the Pages are referred to as Princesses and the Knights are referred to as Princes. 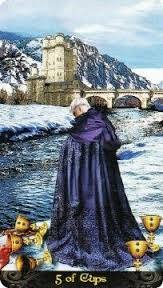 Some of my favorite cards in the Illuminati tarot deck are the World, the Moon and the Prince of cups. Last but not least the four, five, seven and eight of cups depicts images of young lads and men featuring the same blonde cropped hair do that Dunne sports. In a clever trick, Dunne manages to depict himself as the five of cups! Nice! On the overall the Illuminati tarot card deck is absolutely stunning and I feel like I have a very good connection to them. I purchased my Illuminati Kit from Amazon.com. If you would like to purchase the deck visit Amazon.com.